A cartoonist mentor once told me that you can’t have a blockbuster every day, and I suppose the same observation applies to comic books as well. You just can’t have a blockbuster every month, something that today’s comic book publishers would do well to mull over. And so the Flash #138, following on the heels of the previous issue’s blockbusterness, is just going to come off a little quieter. The lead story features a nice little mystery with the Flash, the Elongated Man and the Pied Piper. 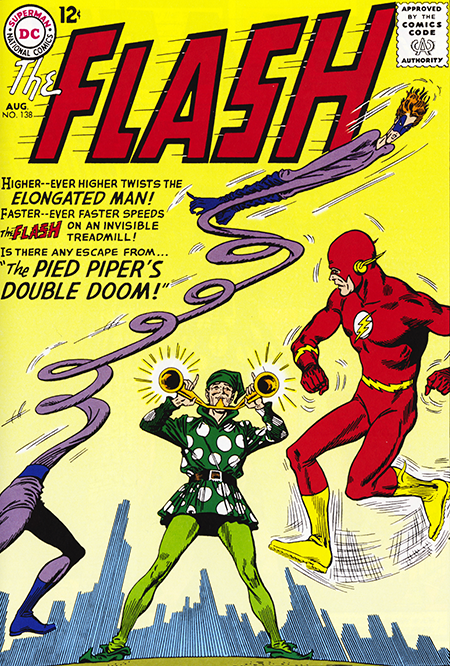 The Pied Piper was never destined to become a major Flash villain partially because of his silly looking throwback of a costume, but mostly because his stories were always just a little bit weak. The Pied Pied was never destined for blockbuster status. That being said, sometimes a quit story can be very rewarding as in the the issues’s second offering, Mystery of the Matinee Idol. The story centers around a down-on-his-luck actor named Dexter Miles who finds himself in the Kid Flash’s town of Blue Valley looking for work at their new summer playhouse. He doesn’t find it and is basically living homeless in the park until getting a boost up from Kid Flash. Even at my tender age at the time, this story resonated deeply with me and became a part of my inner landscape. Maybe it was the work I was hoping and planning to take on that created that empathy. As much as I wanted to be alive and involved with the cultural tsunami that was the sixties, I always had a cold hard eye on that point down the road when the tide would leave you stranded after your short sweet ride. I’m sure that Dexter Miles was subconsciously present when I created Cliff Anger, the forgotten actor who had portrayed Starbuck Jones in an old movie serial, and who was found living in a flophouse in New York City in Funky. To me, this throwaway story in the back go the magazine was the more powerful of the two pieces, and it’s interesting to note that Dexter Miles role in the magazine would one day eclipse the pitiful Pied Piper.